Everything is big in Texas, including the real estate market. 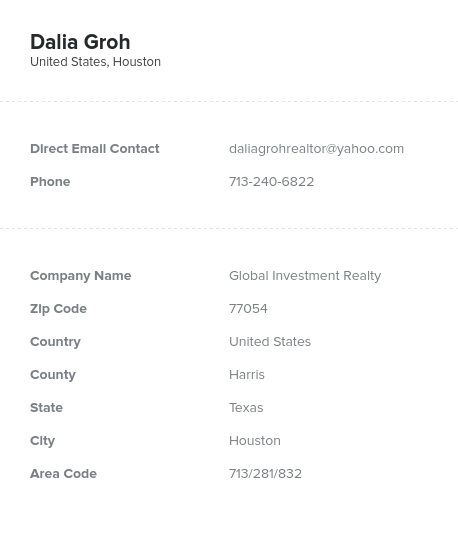 If your company can be a valuable resource for Texas real estate agents, tell them what you have to offer with this Texas Realtors email database, form new B2B connections, and increase your sales! If you want to put your product or service in front of real estate brokers all over the Lone Star State, reach out to potential new customers fast with this Texas Realtor email list, which contains all of the key data you need to make B2B relationships: real names, company details, mailing addresses, email addresses, phone numbers, and more. Our Texas real estate broker mailing list contains sales leads all over the state, from El Paso to Houston and Corpus Christi to Amarillo, so you can reach a wide audience with your marketing message. But perhaps you'd rather focus your efforts on San Antonio, Austin, or the Dallas/Fort Worth area: If so, just use our list-builder tool to create exactly the right targeted business database for you. Either way, you'll be getting premium, human-verified contact information that can help you reach out to Realtors who could be your future customers. We even back our email marketing lists with a deliverability guarantee, demonstrating how certain we are that each Texas real estate agent email database we sell contains accurate information. But you don't need to take our word for it: Just download this list, reach out to real estate brokers and agents in Arlington, Plano, Laredo, or Lubbock, and see for yourself!